The import and export functionality for decision data is extended to help manage generic decision data records. Generic decision data records are records that do not belong to the Strategy Results class. 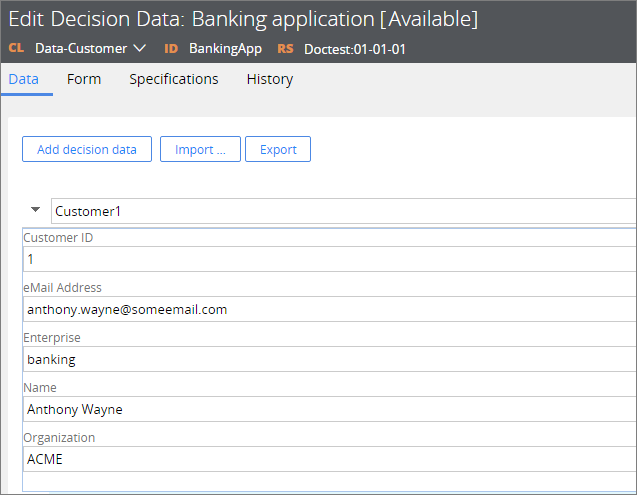 To use the import functionality, you configure decision data records in a CSV file and import the file to the Pega 7 Platform. To use the export functionality, you can save the existing configuration of decision data records to a CSV file and store that file outside of the Pega 7 Platform. The Import and Export options are on the Design tab of the Decision data rule form. 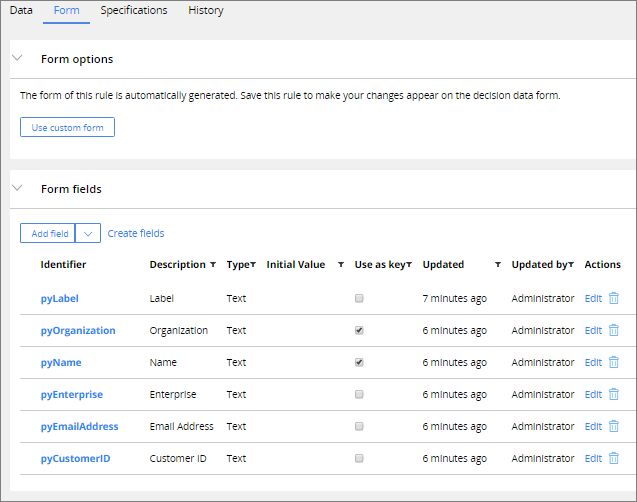 To ensure that each generic decision data record that you store is unique, you can select the properties that are used as keys on the Form tab of the Decision Data rule form. You can use multiple properties as keys. When you import decision data records to the Pega 7 Platform or save the rule instance, the system determines whether the composite key value is unique. If no unique values for properties have been defined as keys for two or more records, you cannot import or save the duplicated records, and an error message is displayed. You cannot edit or define new keys for decision data records that hold the proposition data. If you define pyOrganization as the key, you cannot import or save the records, because the property value for pyOrganization is the same for both records. However, if you add pyName as an additional key, you can import or save those records because at least one property that is defined as the key is unique.